Works in progress . . .
Find my other places . . . .
"Count Grumpula is a vegetarian vampire who doesn't have any friends. Living in his huge castle, with only his man troll, Ignor, for company, he leads a very sad and lonely existence. Then one day, he helps a magical creature in trouble; a deed that leads him to an encounter with the Mistral wood witch . . . "
This is the first of a series of eight books revolving round a mango-eating vegetarian vampire called Count Grumpula. The series is a collaboration between myself and award winning artist Rachael Errington. We are so excited about the series, and our similar ideas and passions ,that we've set up Cobble Creep Creations, a New Zealand based children's book publishing company. Cobble Creep is our magic HQ and we plan to publish other children's books after we have finished the Grumpula series. Available on Amazon!! Buy your copy of the first Count Grumpula book today, "Count Grumpula and the Wood Witch," from your favourite amazon site below! In addition, we have beautifully presented prints, that capture the best moments of the story, also for sale. All are available for purchase from the cobble creep website. Yes! 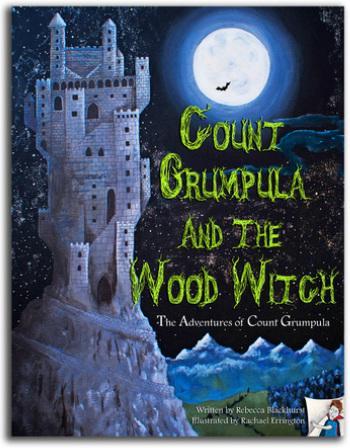 The second book in "The Adventures of Count Grumpula" series is here! Count Grumpula and the Hounds of Hell!!!! Here's an excerpt for you to enjoy . . . .
"Mmmmmm," Grumpula considered. "You are right of course, vampires do have hell hounds." Grumpula knew that this was very true and it was a bit of a sore point with him. Grumpula had once had a hell hound, but his hound, Cassius the Mope, had left him when he'd become a vegetarian and had found a meaty master. Hell hounds had reputations to uphold. Nevertheless, Grumpula had been very sad when Cassius had abandoned him. "But I am different now!" Grumpula said. "I'm a vegetarian vampire. No hell hound wants to protect me since I eat only mangoes. I don't think a hell hound is the answer," he concluded. Look out for "Count Grumpula and the Mango Man!" Coming soon . . . . !